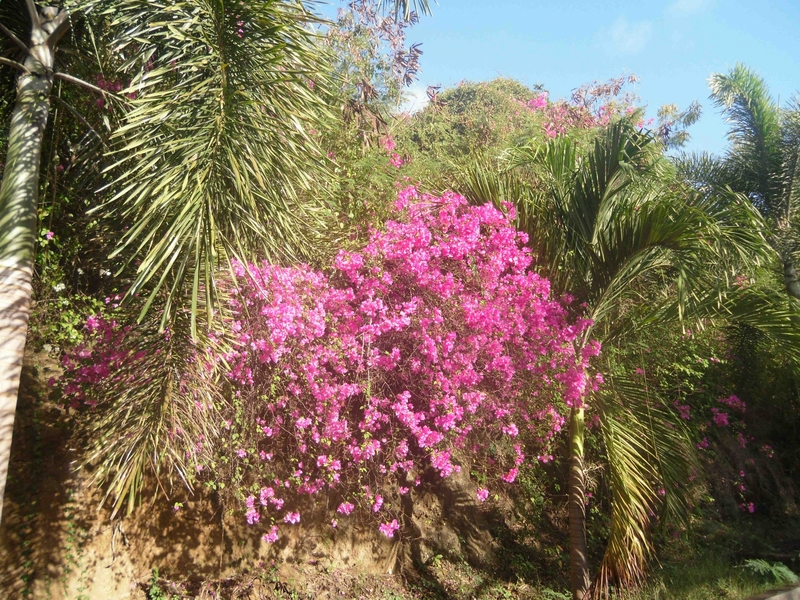 Grenada is our very favourite of the Caribbean islands. This is fortunate, for we ended up staying there for rather longer than intended due to that rumbustious engine of ours. Leaving Carlisle Bay early afternoon was not straight-forward as the engine took forever to get going and once it did would run only on two cylinders with the revs going up and down and black smoke billowing from the exhaust. Another yacht had dragged back and was sitting over our anchor, so they had to motor forward – just as a squall of up to 30 knots of wind and heavy rain hit! The passage was rough and rolly, but with the wind mainly F5 (with a bit of F6 overnight) we had a good downwind ride under jib alone. Our telescopic pole would not telescope, so we had to boom the jib out. Not ideal, but the fresh wind helped to achieve a reasonable set to the sail. During the night the mast started creaking very loudly, from movement where it passed through the deck. I had whacked some hard wood chocks in between the mast and the deck aperture, but they were not working all that well. 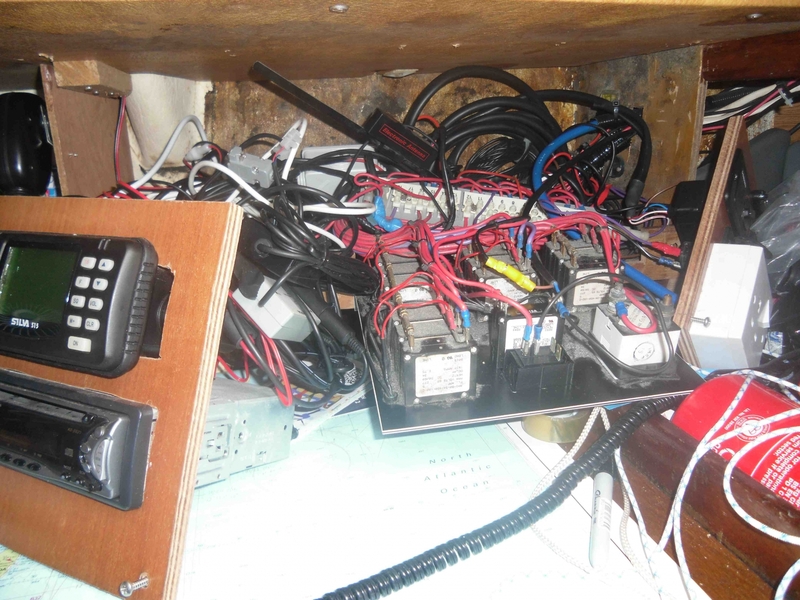 Later during our stay in Grenada I found the missing rubber chock (which had disappeared when the mast was unstepped during our refit) lounging in a rarely visited bilge compartment (no idea how it got there!) and replaced the wood chocks with the rubber ones. The mast never creaked again after that. Whilst en route to Grenada, though, it seemed prudent to roll in a bit of genoa. 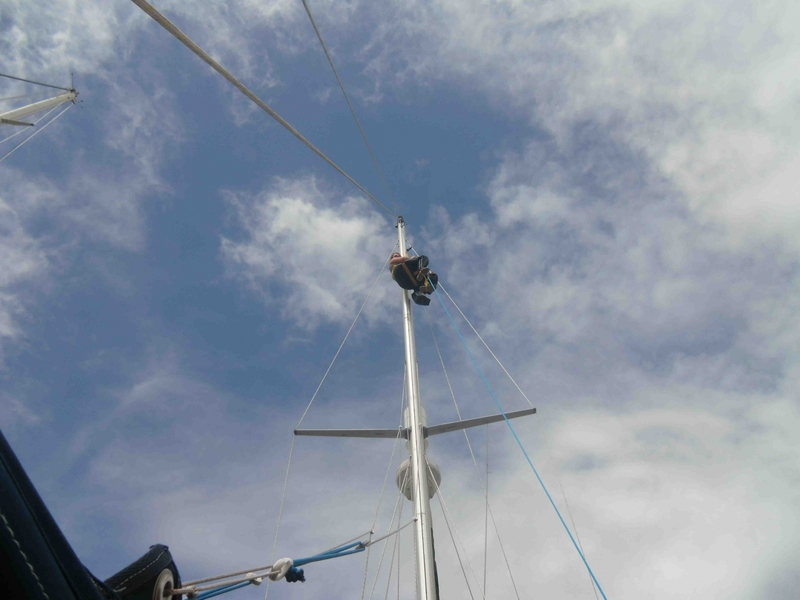 The mast promptly quietened down, but our speed remained good. Base map from the CIA; modifications by and (c) G P Caesar 2012. Over the final eight hours of the passage our speed over ground averaged 7 knots, for which there must have been some current with us. We had not had any discernable current in our favour for the first few hours of the passage, so we could only conclude that as we were heading south-westwards, from 13°N to a little under 12°N (the furthest south we would go) we must have sailed into the North Equatorial Current, which sets to the west at 0.5 to 1.5 knots and which, with the trades having been strong, was probably running close to full speed. 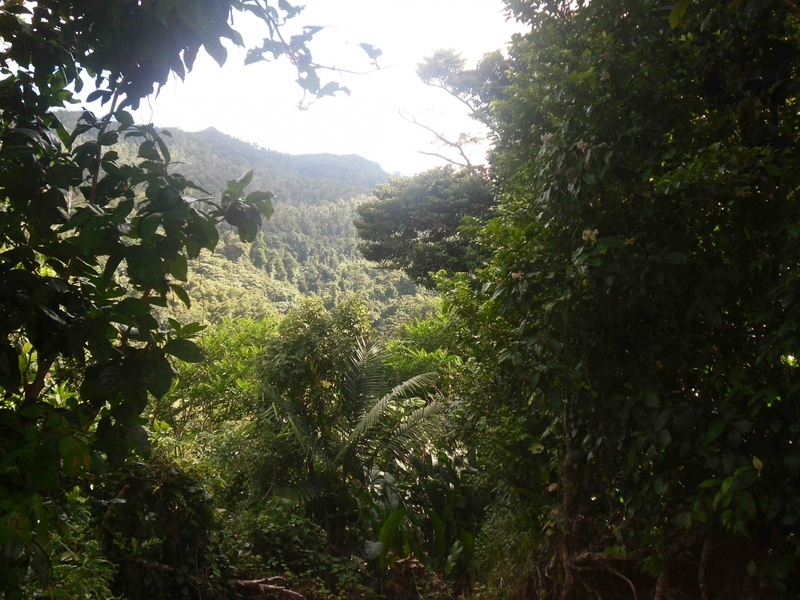 Around noon on the 30th January we closed the very green SE coast of Grenada, bathed in the bright sunshine of a beautiful day. I tried to start the engine. It was having none of it. It would only crank with one cylinder compressed and then would not get up anywhere near enough speed to fire. ‘The Plan’ had been to drop the hook in Prickly Bay and maybe spend a couple of weeks there before moving on. It was apparent that once again ‘The Plan’ would change. We had heard that a boatyard, Grenada Marine, was based in St David’s Harbour, which would be one of the first bays we came to along the south coast (Grenada’s south coast has a bounty of lovely bays and inlets whose shores have fine beaches backed by hills of sub-tropical forest). We sailed into St David’s Harbour where we would clear customs and immigration and avail ourselves of the services of Grenada Marine. The afternoon of our arrival, a mechanic, Pascal, came out to Gulliver G. After having a go at starting the engine to no avail, then squirting WD40 into the air intake whilst I cranked the engine, still to no avail, Pascal determined that the next step would be a compression test. 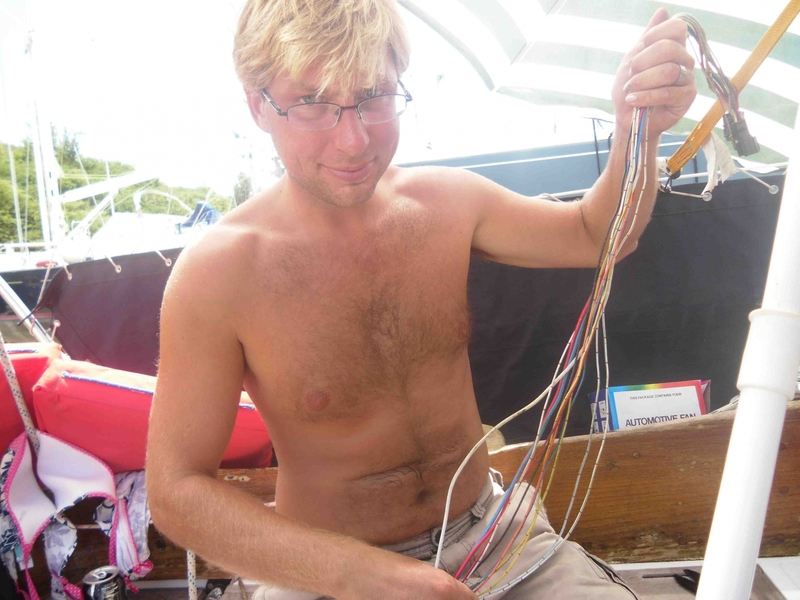 As compression testing involves taking out the injectors and taking various tools aboard, Pascal asked that we see about getting the boat alongside. The next day was a Saturday, so we stayed put over the weekend. On Monday we discovered that, Grenada Marine having only one dock and this being in use, it would be quickest if we got hauled. Another sailor came over with his tender and between our two tenders, and the marina manager at Gulliver G’s helm, we managed to guide Gulliver G into the travel hoist. Fortunately, Grenada Marine had a large work force so there were plenty of people on hand to take lines as the lifting strops were adjusted. Much to our surprise, one of the workers donned a mask and dived in to inspect the hull and the position of the strops before they started lifting. Once lifted, we were pleased to see that Gulliver G’s hull had remained clean. Grenada Marine did a very good job of ensuring that the boat was entirely level as they laid her up outside the engine shop. 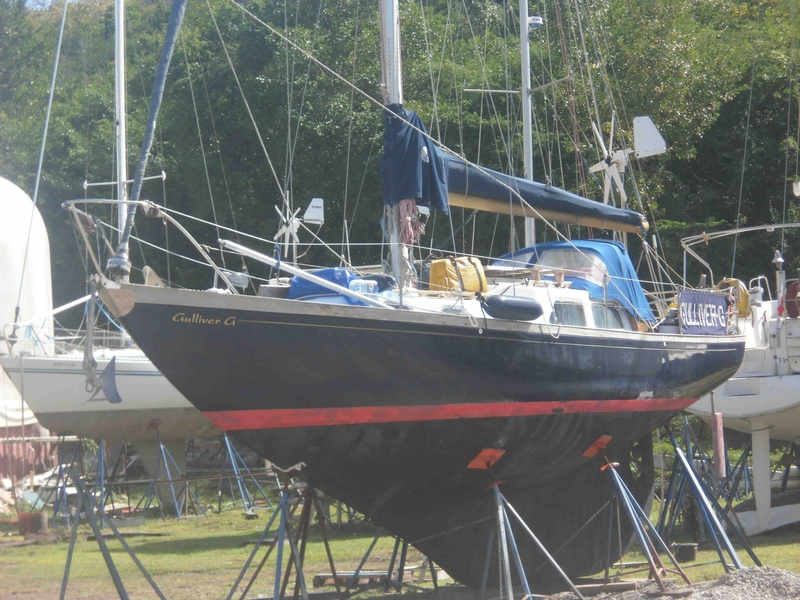 This was a relief as we would be living aboard ashore for a while and back in the UK we had seen her left at some pretty crazy angles by yards over the years, which is enough of a pain for working on her let alone living. By the end of our first night in the boatyard we had learnt a very important lesson: whilst mosquitoes do not tend to be a nuisance at anchor, when ashore the buggers’ll eat you alive. 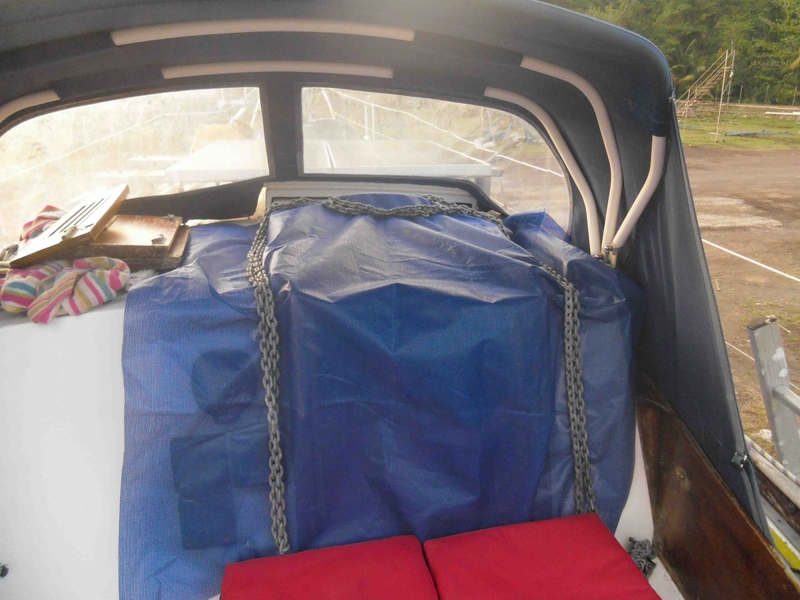 The next day we set about mozzie-proofing the boat (or attempting to, the odd one always got in!). With Gulliver G nicely laid up, Pascal was able to get on with the compression test. Off came the injectors, on went the compression tester. Pascal told me to push the starter. The engine spun. And a load of water shot out of the two cylinders which did not have the tester hooked up to them, and all over Pascal. Fortunately, the tester appeared to be undamaged. This, of course, was not what we wanted to hear at all. We cranked the engine some more to get as much of the water out as possible. Then it had to be left for a couple of days to get it to dry out so that it could be tested – though even in my state of optimistic denial it was obvious that things were not looking promising. Whilst the engine was drying out we got a quote for a new engine, which would be a Yanmar 3YM30 (replacing the old 3GM series). 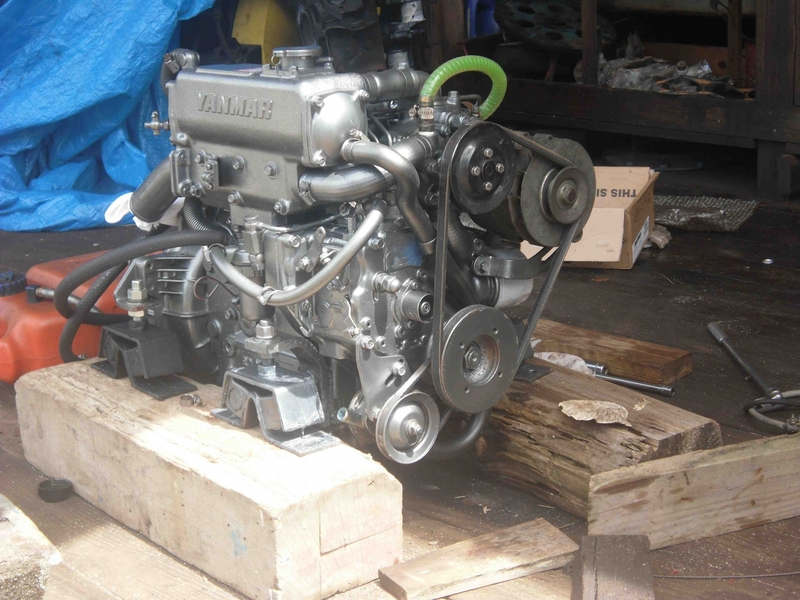 The cost would be about $7,000, including import taxes, and with labour in Grenada being much better value than in the UK it would certainly be significantly cheaper to buy and install a new engine there than in the UK. It was a cost for which we had certainly not budgeted and going down the new route would have a significant impact on our finances. 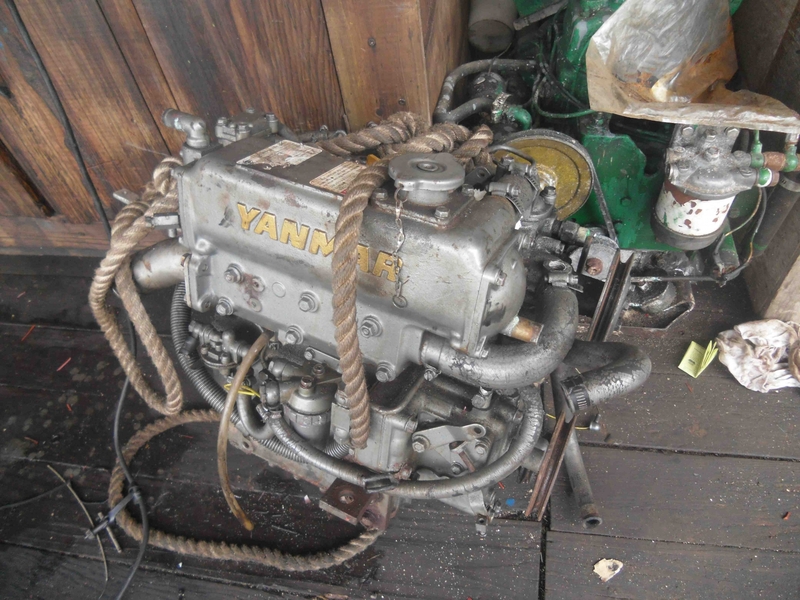 A second option presented itself in the form of a couple of old Yanmar 3GM30s in the workshop which had been taken out of a cat a year or so earlier when the owner had upgraded to bigger engines. Whatever happened, it was clear that we were to be at Grenada Marine for a little while yet, but consoled ourselves that there were far worse places to be hauled! Clockwise from top left: the boatyard featured a bar on the beach; was amidst beautiful countryside with lovely bays and a great beach for swimming nearby; had a little dock for our dinghy; and plenty of exciting flora and fauna – so we were happy enough! The compression test confirmed that our engine was officially dead. All three cylinders were below the compression rating, two of them incredibly so. The yard recommended that replacement of the engine would be far preferable to running up more bills attempting repairs; given the leaking oil seal and other problems which we’d had we conceded the point. The old Yanmars in the workshop looked a bit rusty on the outside and would, of course, come with no guarantees though Grenada Marine could compression test them. Good compression generally means that an engine is in good internal condition. Practising the fine art of (self) persuasion we convinced ourselves that a brand new engine would be the best course of action, rather than replacing with an engine that was even older than ours and would probably need replacing again in a few years’ time. Then we found out the lead time for a new engine: 8 weeks. Add on time to clear customs and installation and we would be looking at nearer three months – or our entire time in the Caribbean. I can still vividly recall the sticky, sickly feeling I got in the pit of my stomach when I found out how long it would take for a new engine to arrive. Was this it? Was the whole of our Caribbean cruising time to be spent ashore at Grenada Marine? Sure, we liked it there – but not so much that we were happy to miss out the rest of the Caribbean. Once again we practised some self-persuasion. It was highly effective as it did not take at all long for us to become convinced that the only viable course of action was the second-hand route. In hindsight this was very much the right choice and it seems hard to believe that we had such good luck as to have the option available to us at all. It took a few days to make contact with the vendor as he was off sailing, but eventually he emailed us back and said that he was looking for $2k for each engine. I offered $1,500 for one of them; a week or so later the acceptance came through. This was a relief as Pascal had already compression tested the better of the two engines, found it to be in good condition and had busied himself with treating the exterior for rust and repainting it. He’d also serviced it and run it for extended periods and it seemed that it was all systems go. Whilst all of this was going on I was able to get some jobs done on Gulliver G, including replacing the mast-head incandescent bulb in the tri-colour with an LED, which represents a huge power saving when sailing at night. I considered tidying the wiring behind the switch panel, but that is one of those jobs I periodically look into doing and promptly decide that if it ain’t broke, it is definitely better not to try and fix it! With the all clear on the new old engine, Pascal completed the refurb and out came our old old engine. For many boats removal of an engine involves significant dismantling of engine compartment and environs, but fortunately ours was able to be hoisted out of the companion-way on the end of a crane without any problems. Old engine before I stripped it for spares. The boatyard gave us a few days before fitting the replacement engine, which gave me time to give the engine compartment a good clean-up. I also checked the cabling for the engine, replacing one of the wires which had almost corroded through – something which would have been virtually impossible to spot with the engine in place but which could have caused engine failure at any time. Shows the importance of checking the full length of all cables and hoses periodically. Valentine’s Day 2012 was a big day for Gulliver G – only two weeks after arriving in Grenada the replacement engine was ready to go in. Being exactly the same as the old engine, no reconfiguration to the engine compartment was necessary, for which we were extremely grateful. 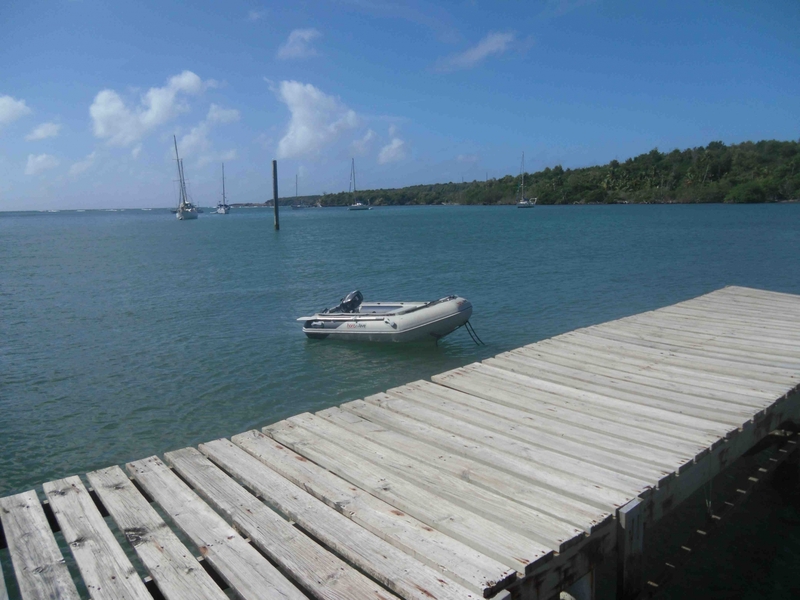 Grenada Marine suggested installing an electric diesel lift pump in place of the engine-mounted diaphragm fuel-lift pump. Because our fuel tank is far below the engine, this was a modification which I had been thinking of doing for years in any case, so readily agreed. The diesel lift pump is the brown cylinder on the left of the right-hand picture below. There was a final piece of work for Pascal to complete: he had identified a couple of fundamental flaws with the manner in which the exhaust system ran, such that Gulliver G was susceptible to sea water ingress again. 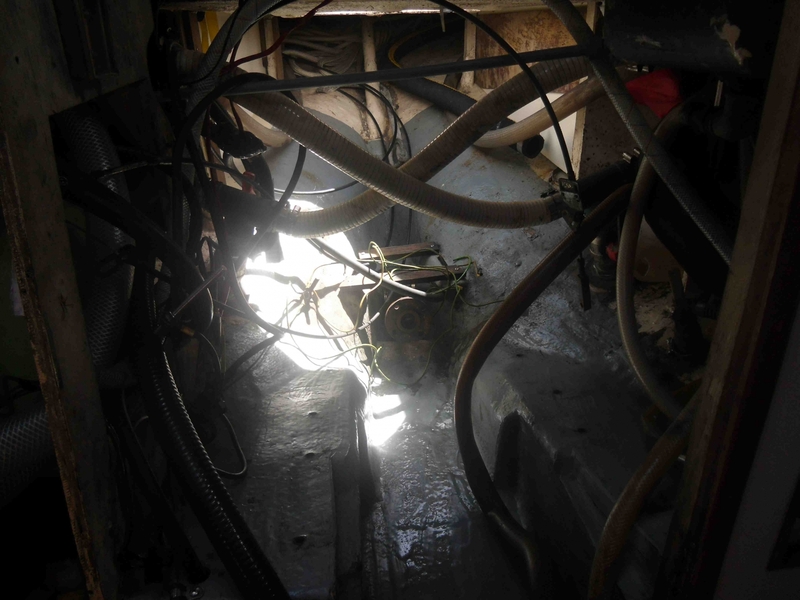 Grenada Marine were very keen that we should get the exhaust configuration fixed so as to avoid losing another engine. The exhaust problem was one with which Grenada Marine were very familiar. When we were there, two other boats were having to get flooded engines sorted – fixed in one case and replaced in another. These were both large boats with engines in well excess of 100hp, so a pretty big deal! Having done some research on the internet I found that the problem of water flooding back into the engine through the exhaust is not uncommon – but does not seem to be widely publicised. 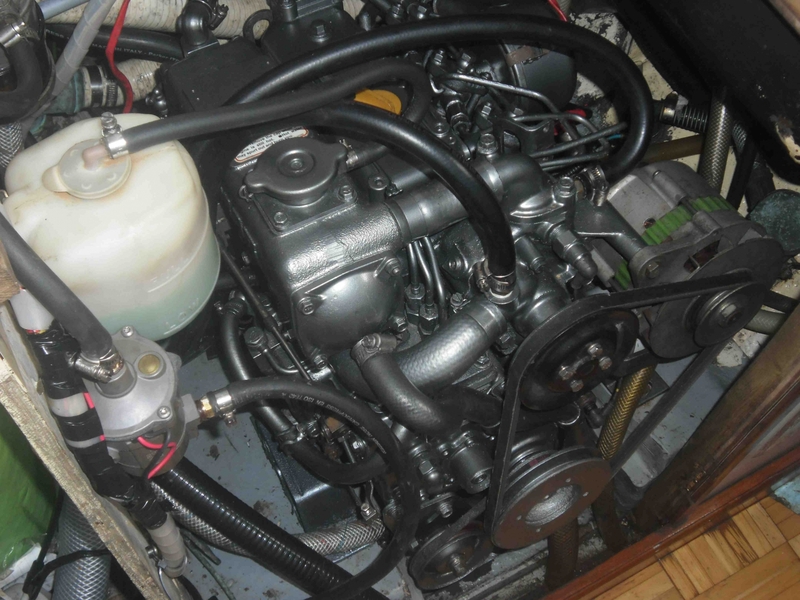 Nigel Calder covers the subject in his excellent Boat owner’s Mechanical and Electrical Handbook, in which he writes: “Every year I get a number of emails from people with flooded engines… More often than not, the engine has functioned fine for years, but then a long-dreamed-of cruise was undertaken and at some point the engine flooded. The common thread is that on an offshore passage the boat got into rougher conditions or bigger seas than it had seen before. The large waves rushing past the boat set up hydrostatic pressures that caused water to syphon into the engine.” So, ours was a textbook example of this not entirely uncommon problem! Calder’s advice on exhaust installation was exactly the same as Pascal was recommending: we needed an inverted U-shaped mixing elbow on the exhaust manifold. Also, the anti-syphon valve needed adjustment as (a) the hose ran from the valve to the bottom of a cockpit locker before rising to the outlet on the side of the hull, making it ineffective and (b) the outlet on the side of the hull had been painted over – also making it ineffective. We were pretty disappointed that Gosport Boatyard had not identified these issues since I had paid them a king’s ransom to extend the exhaust hose and move the anti-syphon valve, having anticipated that there may be problems but lacking the technical knowledge or experience to understand exactly what needed to be done myself. The one mitigating factor in Gosport Boatyard’s defence (despite being a lawyer I had no intention of spending our cruise locked in a dispute with a boatyard, so was perhaps a little too keen to think up excuses on their behalf) was that Marina Seca had not identified the exhaust configuration as the cause of the problem either, instead looping the raw water inlet hose above the waterline as a fix. 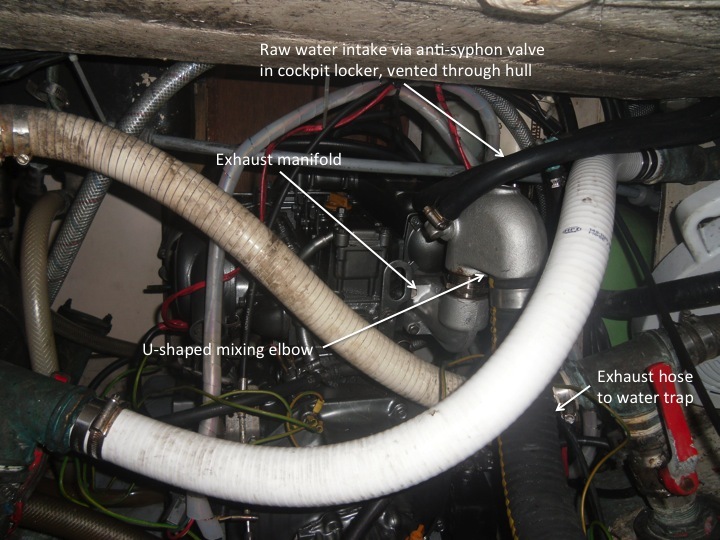 When I had contacted Gosport Boatyard from the A Coruna their advice to prevent further ingress had been, when shutting down the engine, to close the raw water intake valve, run the engine for a further 10 seconds to clear the line, then shut the engine down, then close the seacock on the exhaust outlet. GM’s view was that whilst closing the exhaust outlet seacock was a good idea for longer passages (and something which we had done religiously since A Coruna), it being rather hard to reach it was not something we should have to do for shorter hops – hence their insistence on a permanent fix. The U-shaped mixing elbow was on order from Yanmar long before the replacement engine went in, but would not arrive for a few more days. We were keen to get back afloat as the exhaust could be sorted out on the water, so we were relaunched. In we went, on went the engine. 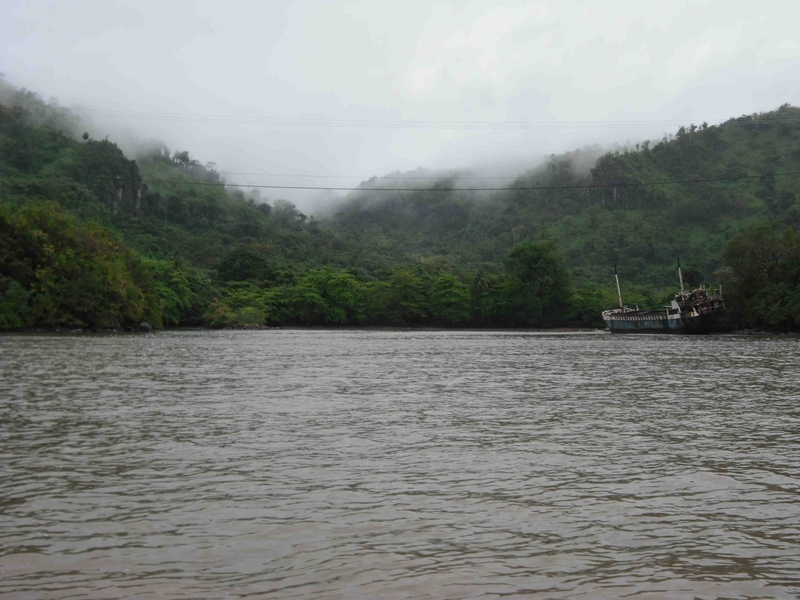 We motored out into the Bay … and the engine stopped! Damn! We promptly dropped the anchor, having fortuitously come to a standstill in the very best spot (someone later commended our skills at locating the best place to anchor, cough, cough). We tried re-starting again, but the engine would not run for more than a few minutes before cutting out. It sounded very much like a fuel supply problem as it would hunt and then die. I went in search of Pascal. It did not take long to figure out the most likely problem: the only difference in the new installation to the old was the use of the electric diesel pump in place of the diaphragm engine-mounted lift-pump. Everything else was the same – including the fact that the fuel return from the injectors was blanked off. As the electric pump pushed the diesel through at a much higher pressure than the previous arrangement, it seemed likely that too much pressure was building up in the lines to the injectors, causing the pump to stop pumping fuel, eventually resulting in a lack of fuel to the engine. The addition of a fuel return line back to the tank fixed this problem. Friends look on as Gulliver G is splashed. Finally the mixing elbow arrived from Yanmar and poor old Pascal spent a very hot afternoon upside-down through the hole in our cockpit sole fitting the new mixing elbow and reconfiguring the exhaust and anti-syphon hoses. 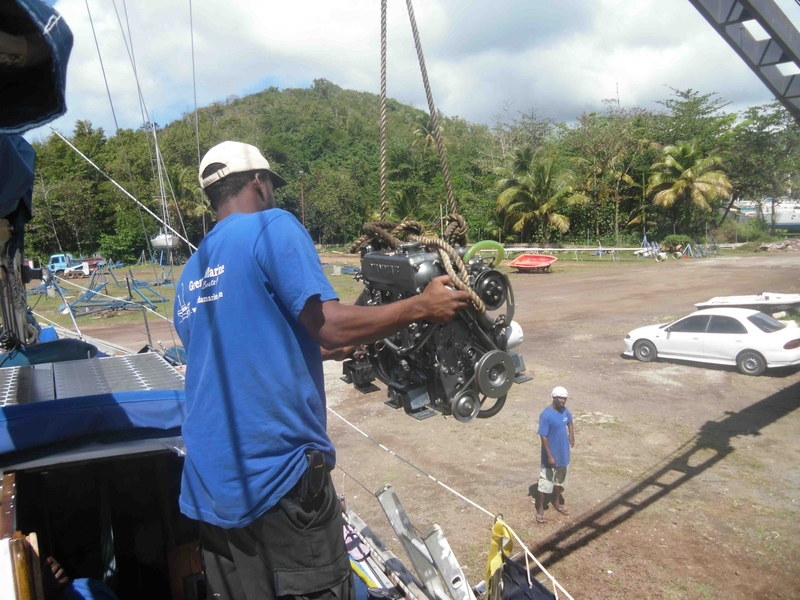 The second-hand engine, all of Pascal’s very high quality work carried out refurbing and installing it, and the storage ashore at Grenada Marine, cost less than the fairly basic few jobs carried out back in the UK. More importantly still, because I was on hand and Pascal was happy for me to help out I got first-hand instruction in how diesel engines work, which consolidated perfectly what I had taught myself, learning from the Yanmar workshop manual and various books on board, as I’d had to fix various problems with the old engine between A Coruna and Grenada. The net result was that I came to enjoy diesel engine maintenance rather than viewing it as a black art only to be practised by a select few who could name their price. water trap (muffler), which is level with the engine and well below the waterline. There was effectively no antisyphon valve, since it was installed incorrectly and blanked-off with paint. 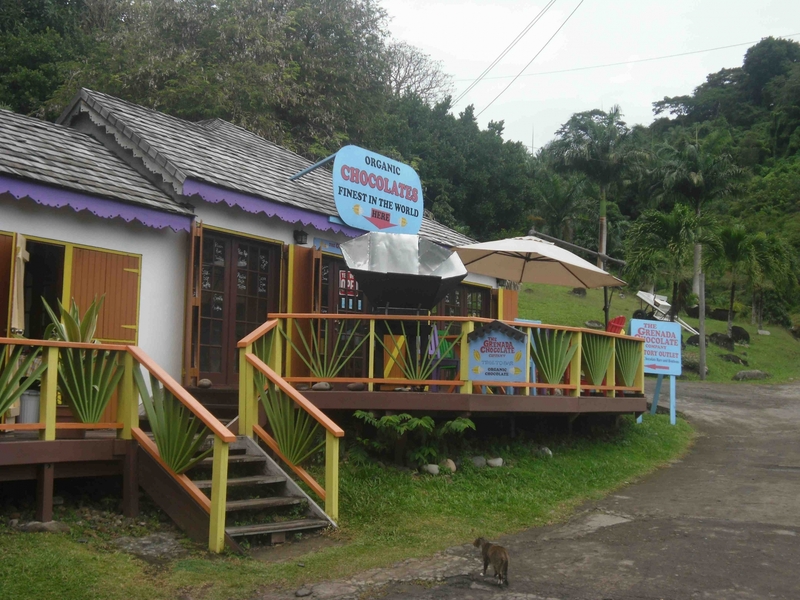 Whilst we were based at Grenada Marine we made a number of trips to St George’s by bus, often stopping for a lunch of local cuisine at the Creole Shack canteen above the main supermarket by the bus station – a favourite with locals. 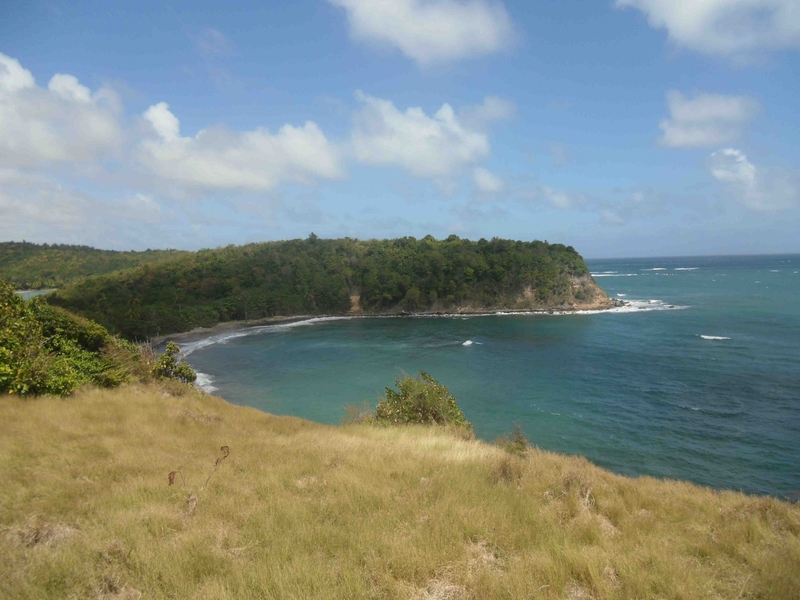 Grenada’s transport service is second to none with a near constant stream of mini-buses passing along the main road it is rarely necessary to wait more than a couple of minutes to get transport to virtually any destination on the island. This enabled us to take some trips into the interior. Five of the Seven Sisters are hard to reach, involving a scramble up near-vertical paths through dense vegetation. These are best visited in the company of a guide after it has been dry for a while. 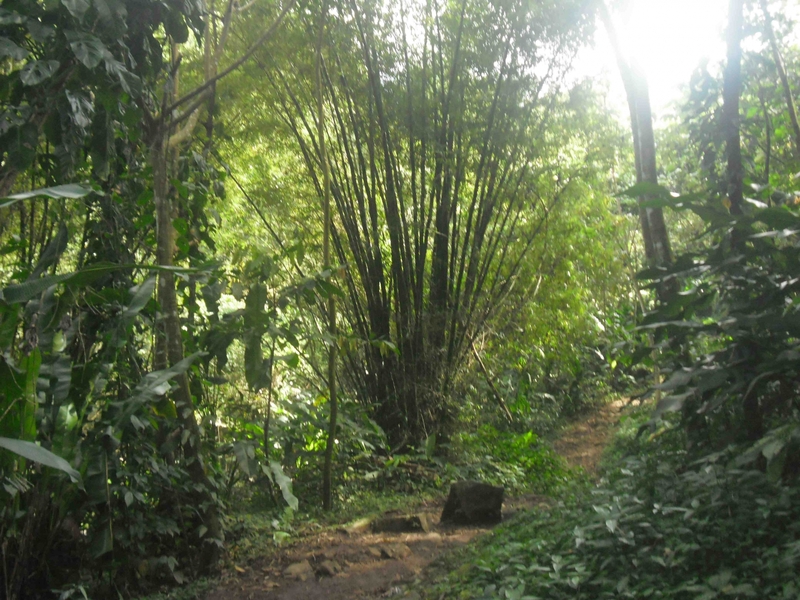 The other two are more accessible, though still involve a lot of muddy scrambling through lush sub-tropical rainforest. 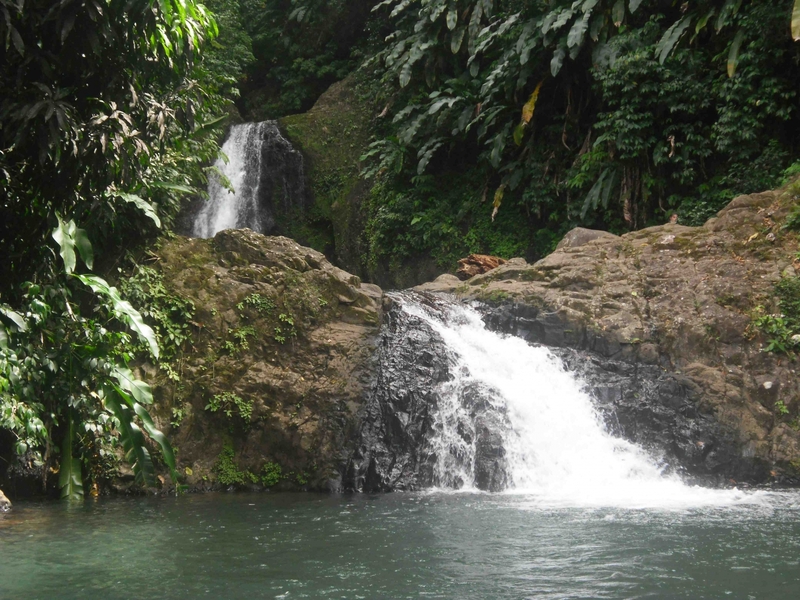 Once at the falls it is possible to cool off by swimming in the fresh, clear pools into which they cascade. Trying to swim toward a waterfall is like a swimming equivalent of running on tread-mill – you never reach your destination! Fortunately the smaller of the falls can be approached from the side of the pool, allowing one to cling to the rocks and receive the best massage of all time! 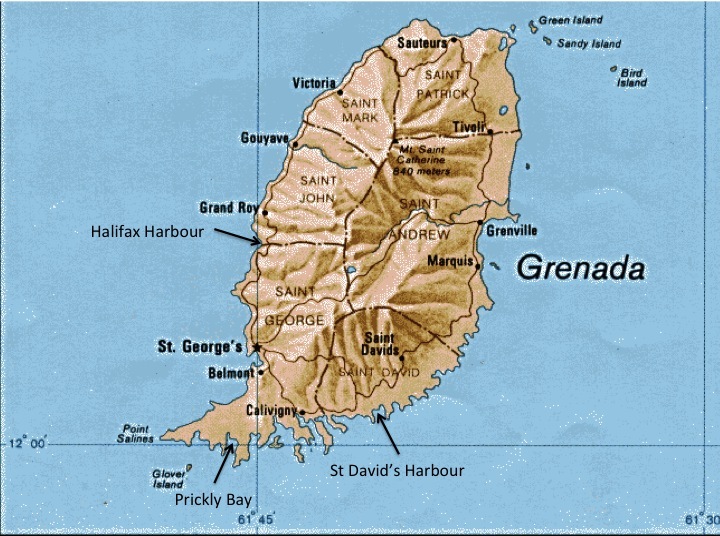 Grenada is known as the ‘Spice Island’, being the world’s biggest exporter of nutmeg amongst other spices. Another popular Grenadian product is chocolate, the Grenada Chocolate Company having been a pioneer of organic chocolate. 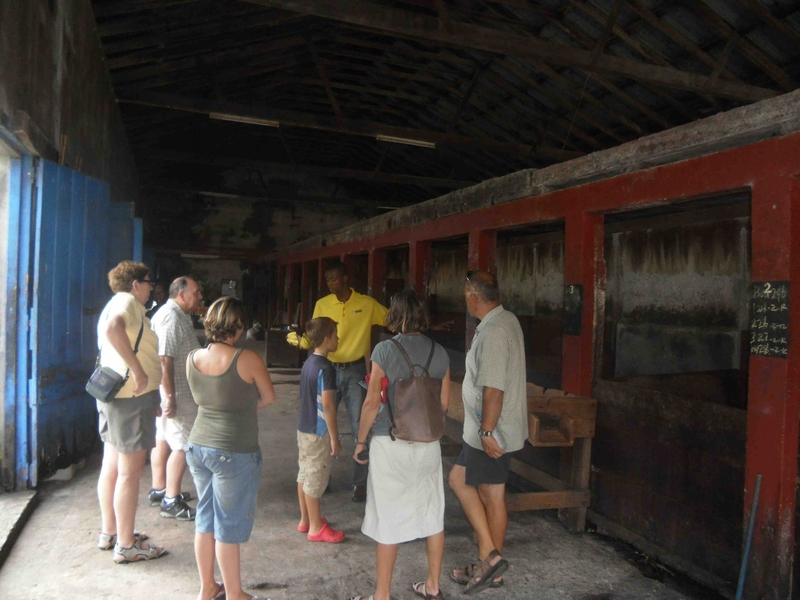 Up on the Belmont Estate in northern Grenada one can learn about the chocolate making process, from the fermentation of the cocoa pods in concrete stalls which resemble giant compost bins (below left) – a process which reeks! 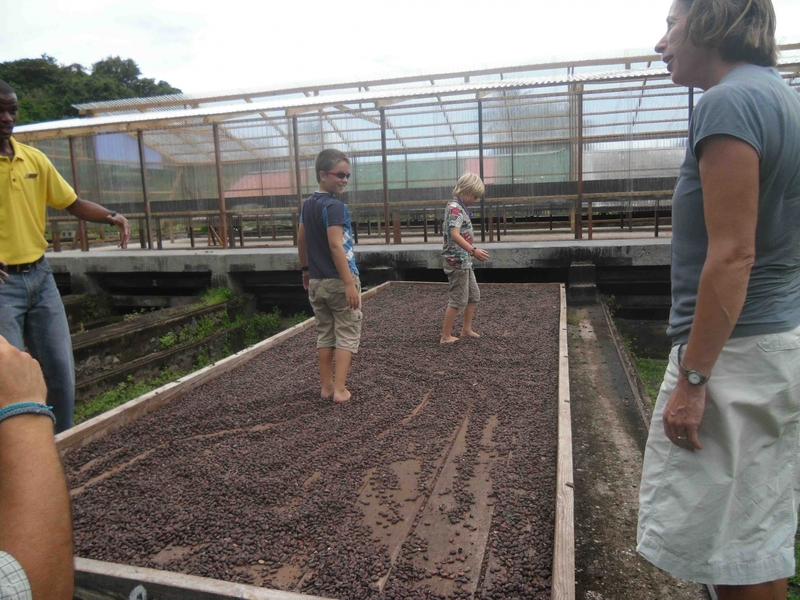 – to the ‘walking of the beans’ (below right), which is carried out as part of the drying process, through to the manufacture of the final product. Which one then gets to taste. Very nice. The Caribbean is awash with rum. Even the good stuff is cheaper than the cheapest wine available on all but the French islands, so it soon became our regular evening drink as the supplies of Pingo Doce wine dwindled. 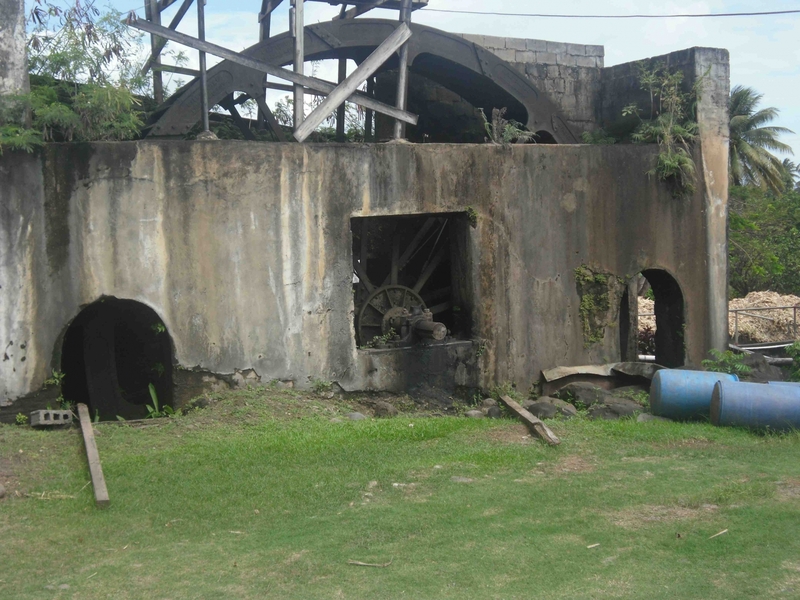 Over forty of the islands’ rum factories offer tours, but as the Antoine Rivers Rum factory was close to the Belmont Estate and as we and our friends had a few hours spare after the chocolate tour, we decided to go there. The ingredients and processes have barely changed in the almost 200 years that the factory has been in existence – and nor has the equipment. First on the tour was a cast-iron water-wheel, shipped out from England almost two centuries ago. Despite all appearances to the contrary, the wheel is still fully operational. The wheel is fed by the Antoine Lake. 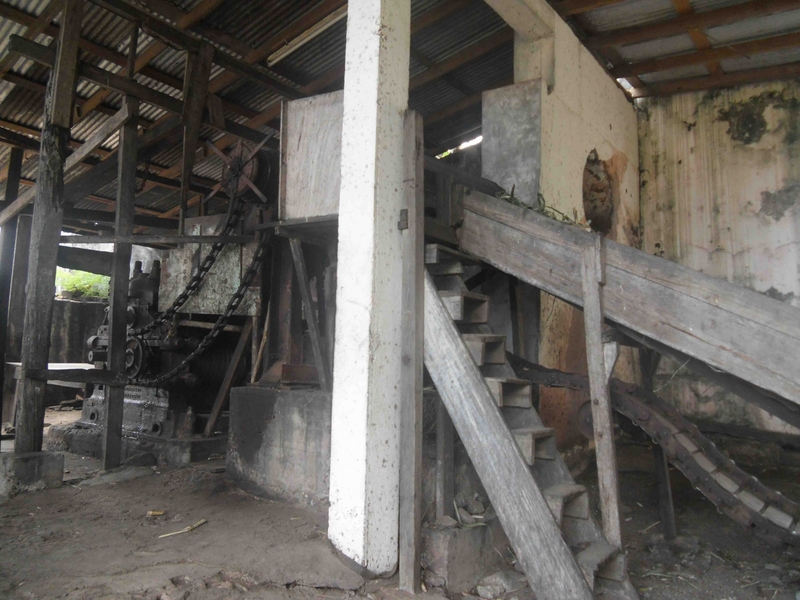 It drives a metal conveyor belt which feeds sugar cane into a mean-looking mangle, also driven by the wheel. 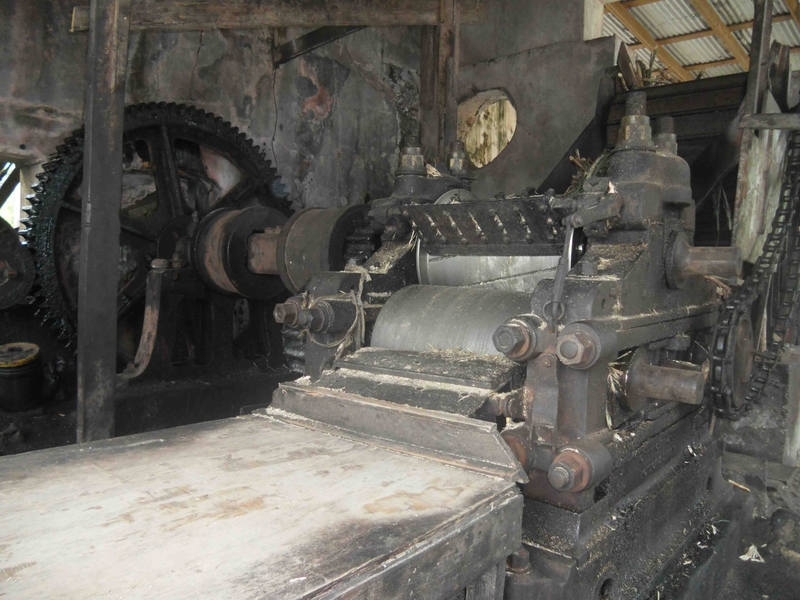 Both the conveyor and the mangle are the same vintage as the wheel. 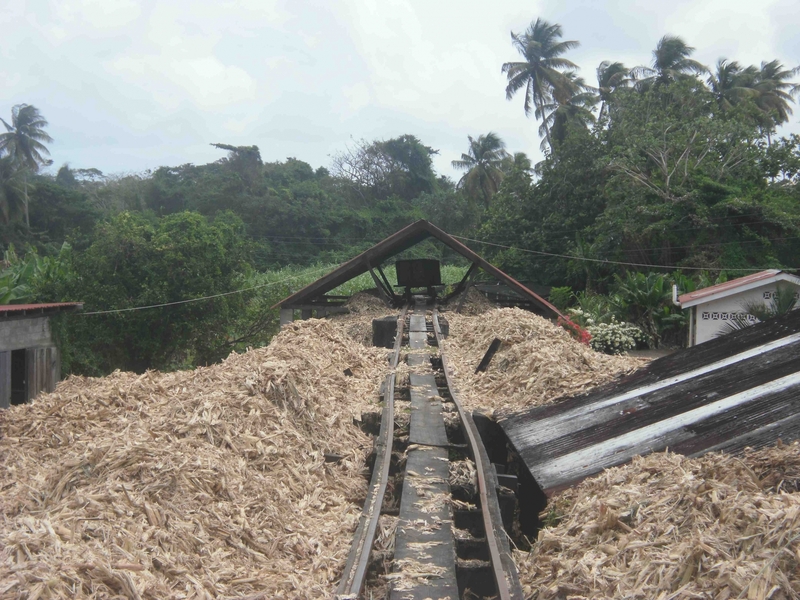 The spent cane is removed from the mangle into a cart and stored along the track side. 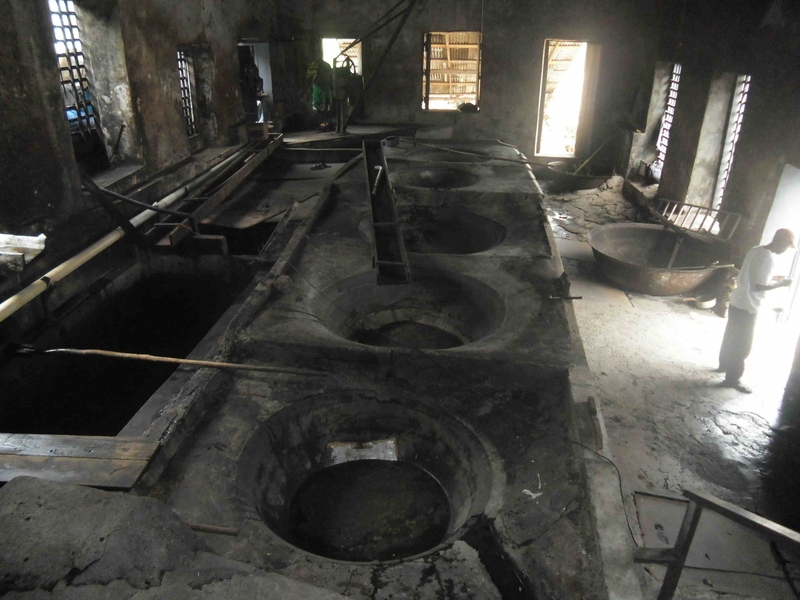 In the meantime, the juice which has been squeezed out of the cane is drained into large iron vats under which fires are lit. 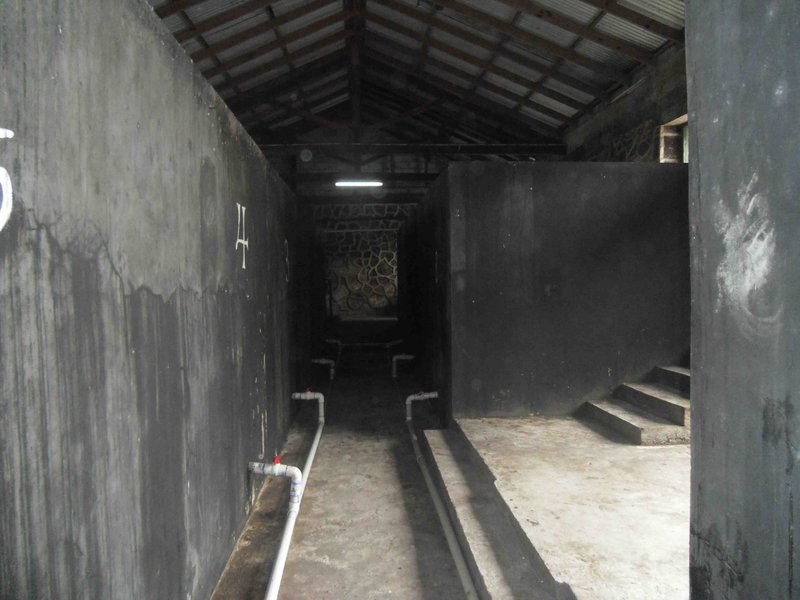 The cane juice is heated and slowly ladelled up the row of vats, eventually being moved into the fermenting tanks (below left). 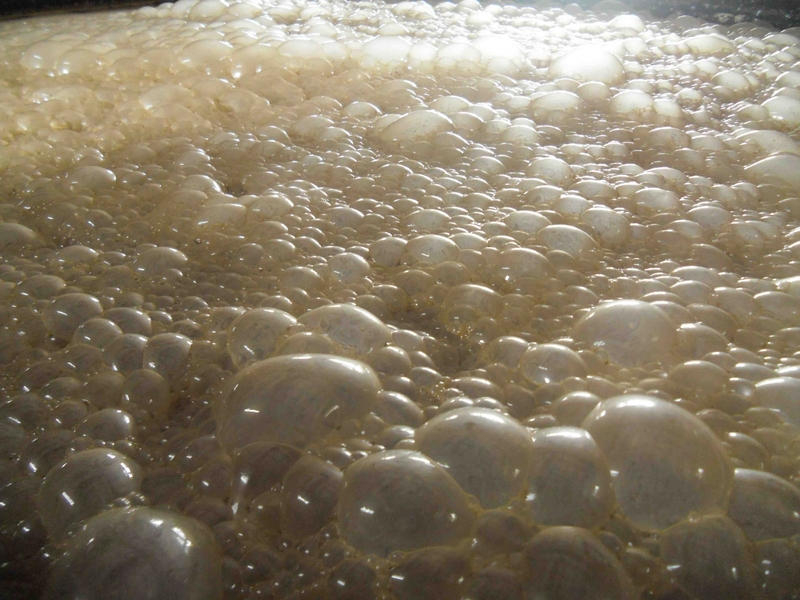 At first the liquid starts to bubble gently (below centre) and then more aggressively (below right) as it reaches the point where it is ready for the still. 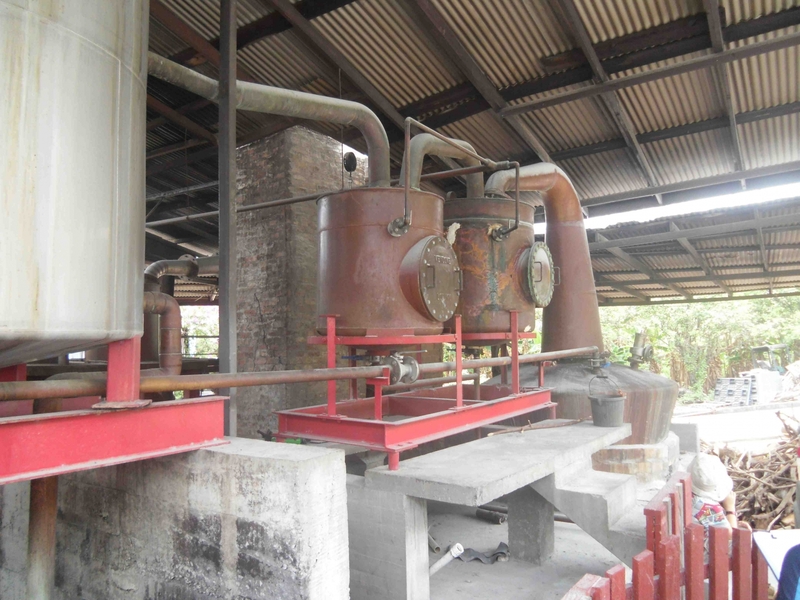 The distillation process, in slightly more-modern looking equipment, is the final stage. Our guide assured us that the process is repeated for as many times as is necessary to achieve the right alcohol content – a minimum of 75%. Any less than that and the rum goes back through again; often the end product is in excess of 80%. We asked whether any of the 80,000 bottles produced each year were exported. 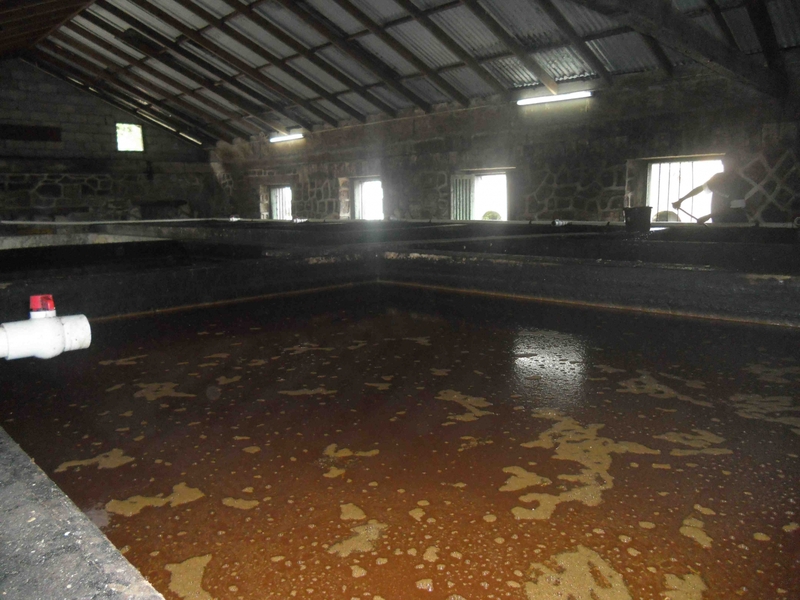 When it came to tasting the end product we felt that Grenada was welcome to keep Rivers Rum to itself – the stuff is like paint stripper; my throat burnt for about five hours after taking a sip. No wonder it is classed as high explosive by aviation authorities. But, a very interesting tour! Finally, all jobs on the engine completed we were ready to depart for our original Grenadian destination, Prickly Bay. Despite now having a working engine, we sailed the anchor out. Old habits die hard and, in any event, it is a good one to keep up. We slowly edged our way up the channel through the reefs which line the entrance to St David’s Harbour. We were in the wind shadow of the hills, but could see that out beyond the reef the surf was running hard. 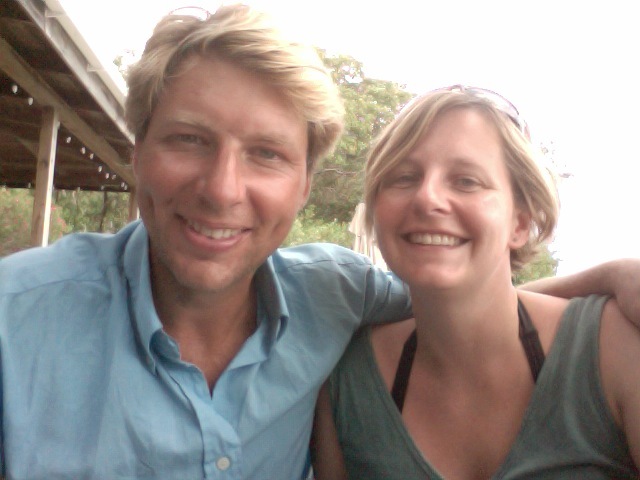 Soon we were in moderate to rough seas, the wind blowing F5/6 from astern – swim-wear weather in the Caribbean! A couple of hours later we were heading into Prickly Bay. 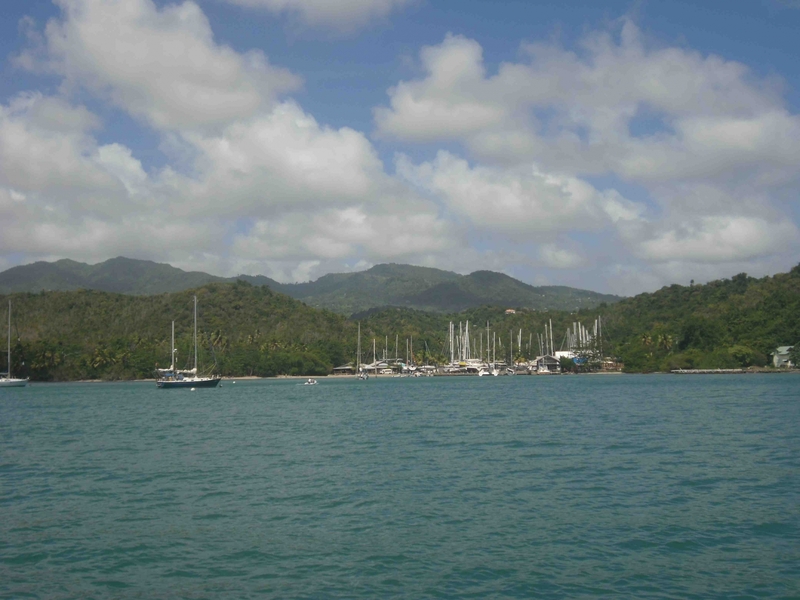 Being one of the most popular anchorages in the Caribbean it was predictably packed and we did not feel that we had really missed out too much by spending most of our Grenadian time back in St David’s Harbour. 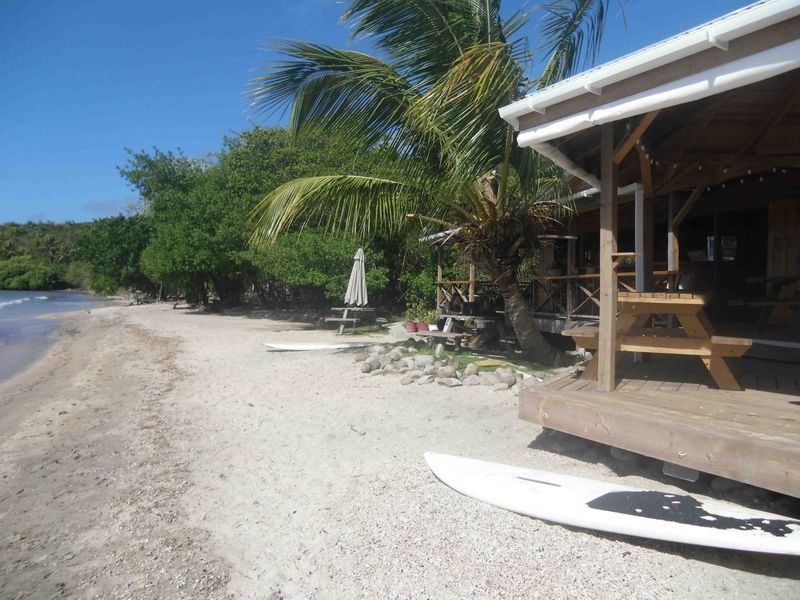 We had two main priorities for our few days in Prickly Bay: (1) stock Gulliver G for the better part of a month of cruising the Grenadines when we anticipated that we would be able to buy very little and (2) get pizza at the Tiki Bar. 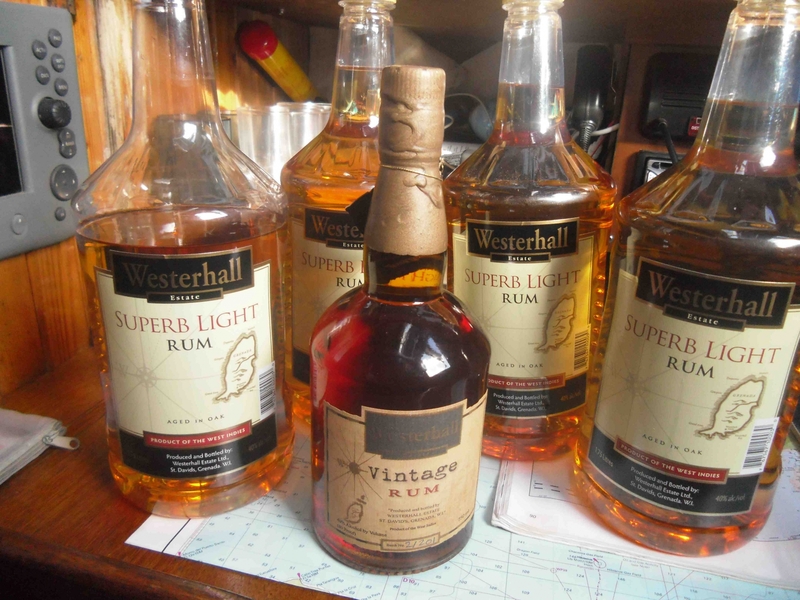 In three days we had achieved both goals – the latter twice – our ‘Basket of Plenty’ burgeoning and our rum reserves replenished. We also had a couple of strokes of luck. 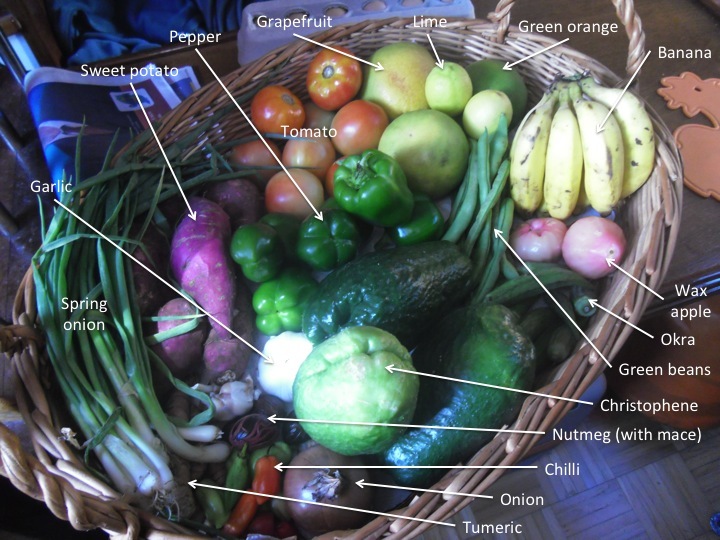 Firstly, we had been fretting about having to spend hundreds of dollars on paper charts for the rest of the Caribbean. I mentioned our lack of charts to a friend over Tiki Bar pizza no. 1. It transpired that he had several chart folios covering the whole of the Caribbean in great detail which he no longer needed and was happy to exchange for a couple of cases of beer. Job done. Secondly, when we went for Tiki Bar pizza no. 2, on our last night in Prickly Bay, it turned out that it was Bingo night. As everyone there – easily 150 people, including a lot of local youngsters(!) – was Bingoing Kate convinced me that we should join in. Never having played before I grudgingly agreed to go and get a Bingo card, picking up the first on the large pile of cards which had been inspected and rejected by other players in favour of cards they felt would give better odds. A while later I was sprinting to the stage having yelled ‘Bingo’! The EC700 prize was shared between four, but EC175 amply demonstrated the concept of beginners’ luck. On the morning of Thursday 1st March English Channel weather had set in at Prickly Bay, by which I mean the grey dreary drizzle of the type which we had in L’Aberw’rach which reduces visibility almost as drastically as it reduces one’s inclination to go anywhere. The only small problem was that the previous day we had checked out of Grenada. 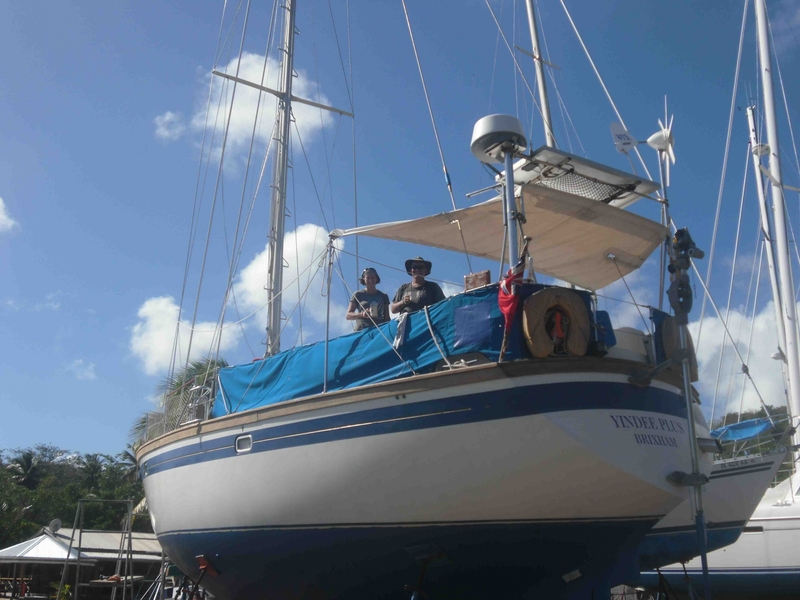 ‘The Plan’ had been to leave early in the morning and sail up Grenada’s west coast to anchor illicitly overnight at Tyrell Bay, Carriacou (part of the Grenadian Grenadines). PassageWeather.com had been showing good easterly winds, around 20 knots, and small seas (albeit from NNE once we cleared the top of Grenada). What Passage Weather does not show is rain. We knew that some rain was forecast, but expected this to be the typical Grenadian downpour which just as quickly dries up. What we woke to when our alarm sounded at an optimistic 0620 was the thrumming of thick wind-swept drizzle. So, we rolled over and went back to sleep. By midday the weather had improved a little. We were keen to make a move, so decided to head for Halifax Harbour, on Grenada’s west coast, for the night, there now being no way we would make Tyrell Bay in daylight. The drizzle returned mid-afternoon, the light winds requiring us to motor-sail. Shortly before 1600 we arrived at Halifax Harbour – or what we took to be Halifax Harbour, for it was much smaller than we had anticipated and despite what the GPS told us we were not at first entirely convinced that the tiny bay which we could just about discern through the gloom was our intended destination. At anchor, Halifax Harbour. We are the only boat here, which is a good job as it is a tight little hole! Drizzle had set in properly by mid-afternoon and continues as I write at 1730. Halifax Harbour is a very picturesque small bay with a sandy bottom and there are no signs of the rubbish dump mentioned in the pilot book, save for a few flies – hopefully they will clear off at nightfall and not be replaced by too many mozzies! On our first approach to the bay, vis. poor in the rain, it seemed v. tight and I became convinced that there was a thick black cable over the bay (on the chart cables are marked at 20m over the NE and SE corners of the bay), so we turned back out and dropped the hook a little further N. It would not bite, so up it came – clean, a rocky bottom – and we decided to give Halifax Harbour a closer inspection. It transpired that my eyes were playing tricks on me, not helped by the vis., and that the thick black cable ran to the back of the bay, not hanging over the centre, allowing a perfect Gulliver G-sized space, anchoring in sand in 35 feet. The bottom is obviously very soft as the prop churned up a lot of brown wash even in >50ft. The Plan: to head for Union Island tomorrow – though the weather shows no sign of improvement, so we may be in for a wet and miserable trip!